Be prepared and bring tissues because Narcissu is up there in the 'saddest things I've ever read' department. I should have been prepared from the start - after all, a story about people with terminal medical illness will never be a happy story. Emotions aside, Narcissu is an artistic and thought provoking story that should not be missed by visual novel fans, especially since it is free-to-play on Steam. Since this is a JRPG blog and not a visual novel blog, I'll briefly explain what a visual novel is. A visual novel is basically a novel that you would read in a book except with photos, voice acting, narration, music and usually choices you can make that influence the story. The last part is what interested me in visual novels as I always chase different endings in RPG and if I hear a game has multiple endings, I'm in. Narcissu is not a story with choices or any gameplay elements whatsoever but it does have art and voice acting. It is more 'novel' than visual novel, but still a visual novel nonetheless. The story is told by a nameless male protagonist who is admitted into hospital due to terminal illness. He is admitted to 7F, where patients are looked after while they wait to die. Here he meets a girl called Setsumi, who doesn't say much other than 'Not particularly' initially. It is revealed by Setsumi that she is about to be allowed to go home for a little bit for the third time. But that's not a positive: the patients on 7F have a history of dying before either coming back to the hospital again or before their next trip home. In short, their is no fourth trip home. The story really sets off when the pair end up running away from the hospital in a stolen car, motivated by the fact that neither of them want to die at 7F or at home. One of the things I found brilliant about this concept is even though it's a boy and girl running away together, Narcissu is by no means a love story. In fact, the protagonist and Setsumi are barely friends before they leave 7F. The story is about two people with a shared point of view and similar fates enjoying freedom in their lives for the first time. A lot of what is interesting in the story is wondering where they will end up and how long their trip will last rather than their relationship, at least until Setsumi starts to become more open. While the characters are slowly displayed to be a little more complex, not much is explained about how and why both characters react the way they do. There were a few things I would have loved to know. What made the protagonist so impulsive - did he just crack after being oppressed for so long? Why is it suddenly okay for him to steal when he has never mentioned doing anything like that before? He only acknowledges once in the story his actions are selfish. This doesn't make him unlikable, but I had to assume a lot of things about him, such as his reasoning to steal the car was because his family never ever considered letting him use theirs and his other stealing actions are just out of pure desperation. I also had to assume that no one came after the pair who stole the expensive car because they felt sorry for them. Things were explained a little more about Setsumi, but I do wonder about the things that were left out - like why she became so quiet in the first place and why she had money saved up. Making assumptions again, I feel like maybe these were left out so that they could be addressed in Side 2. The emotional story is boosted by it's soundtrack and minimalistic visuals. A majority of the visual novel's music is filled with a subtle, sad and melodic piano that really help set the tone of each chapter. The visuals usually involve a small photo that relates to or shows something for the scene. I loved this art style as it gave enough of a visual to show you what was happening, but still allowed the reader to think of the rest. Narcissu's menu provides you with two different translations. I tried bits of both English translations and both are well written and polished. What you like will be personal preference - I personally liked the flow of gp32's translation better, although Aiglis' translation is to be commended for being artistic and well written at the same time. Also provided is a voiced or unvoiced option for the story. This will be pure reader preference. The writing is certainly good enough without the voice acting but I rather enjoyed being able to hear Setsumi's tone while she spoke. Lastly in the menu, I found that the save function didn't work at all. Definitely not a game breaker, but it's worth mentioning. Luckily the visual novel does remember what chapters you have unlocked, so I just chose to read chapter by chapter. Even with it's imperfections, Narcissu's emotional story hooked me in and when the ending hit, the story gave me a one hit KO directly in the feels. Although it lacks in background story sometimes, the novel is powerful enough to still get it's story across and keep the reader intrigued for the whole three hour experience. If you're a fan of a good story, I recommend going on the minimalist, emotional trip that is Narcissu. I read this over a few nights in a little under 3 hours and cried like a baby when it ended. 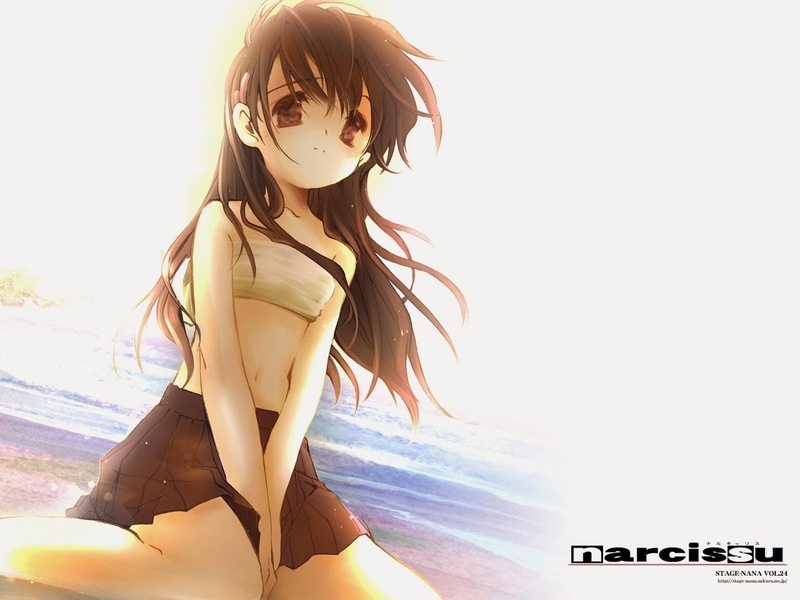 You can read Narcissu Side 1 and 2 for free on Steam.